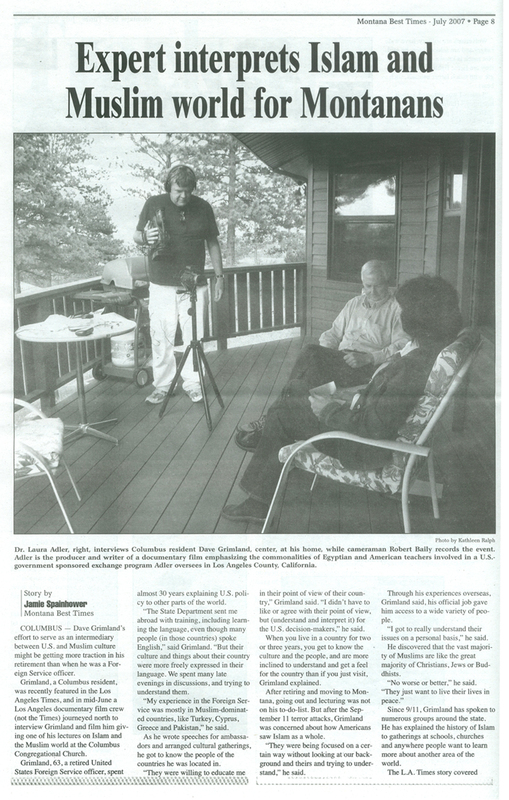 The 2007 documentary film “Just Like Us” was shown in 2009 on Montana PBS. It can be also be viewed on -line at http://vimeo.com/22524801, or the DVD ordered through the inter-library loan system from the Stillwater County Library. Dave Grimland makes a point as he speaks about the Muslim world. Dave Grimland is not a Muslim, nor does he claim to be an expert on Islam. 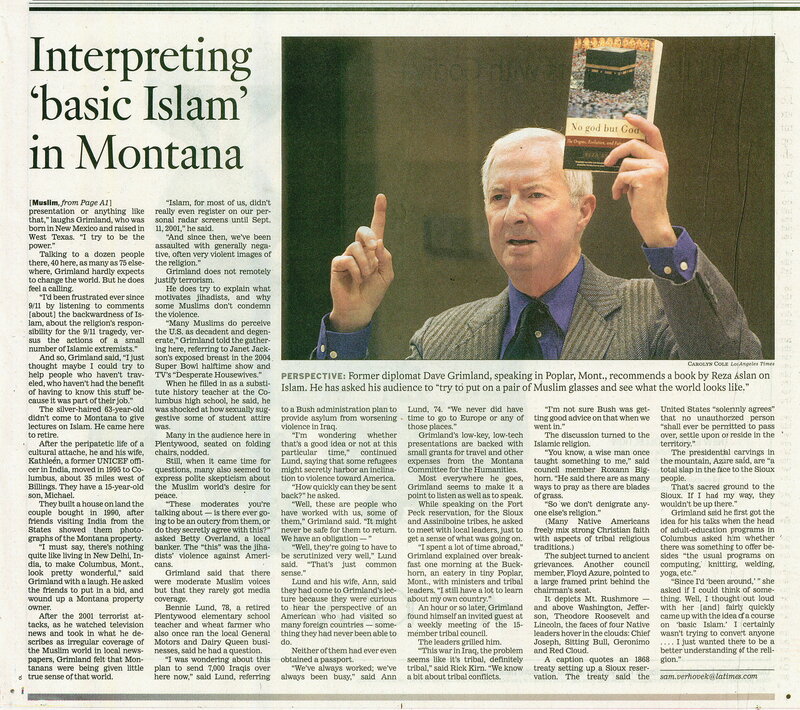 But the former diplomat, who spent nearly three decades working in predominantly Muslim countries, has invested the past five years speaking about Islam across Montana and beyond. His purpose: to help Americans question stereotypes that breed tension and violence between the West and followers of the world’s second-largest religion. “(After) 9/11 and the invasion of Iraq in 2003, we were being fed an image of Muslims that did not connect, in any way, with my years of experience with them,” Grimland said. In Plentywood, 50 people traveled through a snowstorm to hear Grimland speak. Down in Birney, two dozen showed up. 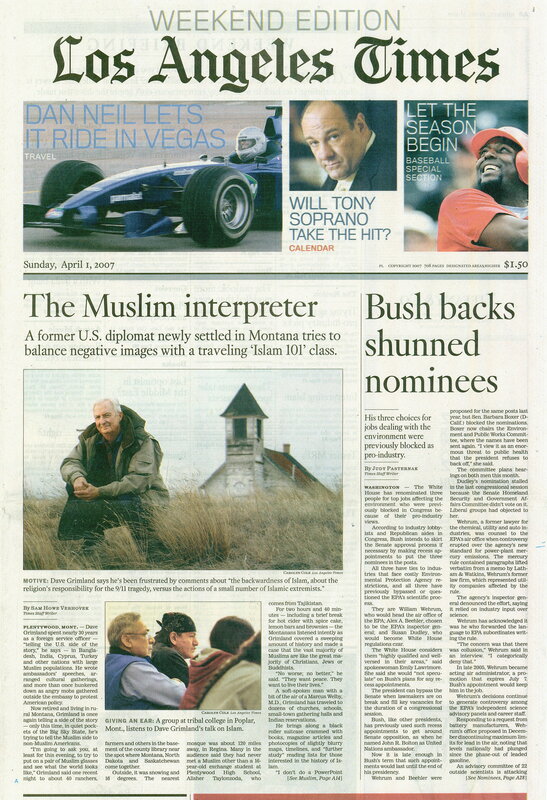 On Thursday evening, Billings residents will get a chance to hear the man whom the Los Angeles Times referred to as “the Muslim interpreter” speak at the Billings Committee on Foreign Relations. In the last five years, he’s spoken at more than 100 venues, and he’s gathered an e-mail following, representing all spectrums of political persuasions, that counts more than 130. His message is that the vast majority of Muslims share the same concerns as Americans. Citing sources and articles, he also dispels the notion that moderate Muslims haven’t tried to denounce the violent extremists who share their religion. Most amazing to Grimland is the reception he’s received. “I think I’ve covered every corner of Montana and a huge chunk of the middle,” he said. “It’s very encouraging to me to see the interest of small-town residents of Montana, who come out to participate. They came in Carhartts and muddy work boots — and not just to sit and listen but to take an active role.” By why do they show up in the first place, to hear someone they don’t know talk about a subject they’re not familiar with? Grimland speculates that some may have personal ties — a son or daughter in the military — that draw them. Yet, his audiences are not without skeptics. Most of his sessions have attracted one or two “mildly hostile” individuals. In nearly every instance, however, the rest of the audience has censured the antagonist and restored a sense of civility back to the debate. Grimland knows of no one else who does quite what he does, but he’s cites student organizations and professors (he’s aware of an adjunct professor at Montana State University) who strive for similar goals. He’s also encouraged by surveys that show awareness is growing. One survey, conducted in 2002, revealed that only 2 percent of Americans knew the name of the Muslims’ God (Allah) or its holy scripture (the Koran). Posed similar questions by the same polling firm last month, 58 percent of those surveyed were able to respond correctly. “It’s maybe not enough, but we’ve come a long way,” he said.